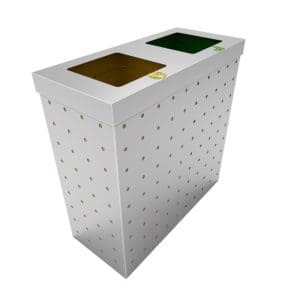 Customizable to the slightest detail to perfectly blend with any type of interior décor and adapt to your needs, our indoor recycling bins will make recycling a breeze! Crafted keeping functionality, quality, and aesthetics in mind, our recycling bins makes the perfect addition to your sustainability program. 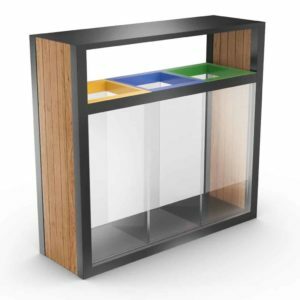 As the number one manufacturer of indoor recycling bins, Urbaniere offers a wide range of multi-bin containers for offices and workplaces. 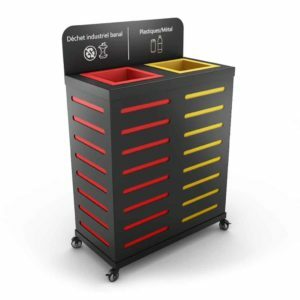 Firmly committed to sustainable development and waste management, Urbaniere designs and manufactures stylish and inexpensive waste bins dedicated to the different areas of your company, such as corporate restaurants and canteens. 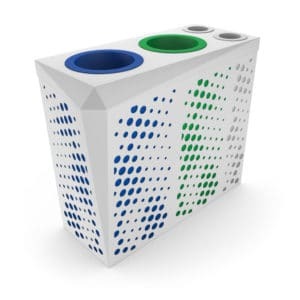 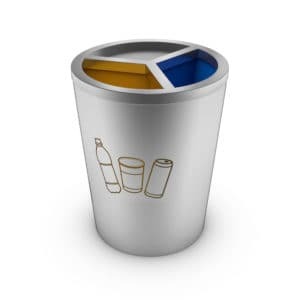 Urbaniere also develops smart containers for paper & plastic or specific collectors for cups & cans. Discover here our unique choice of customizable indoor bins, and buy an indoor container that suits YOU, for a tailor-made usage. With 2, 3, 4 compartments, our colorful indoor recycling bins simplify the distribution of waste thanks to their colored bins. 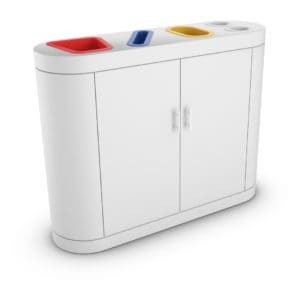 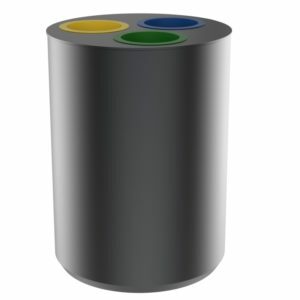 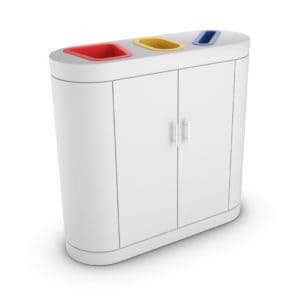 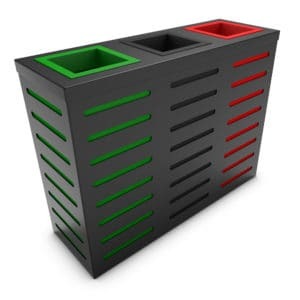 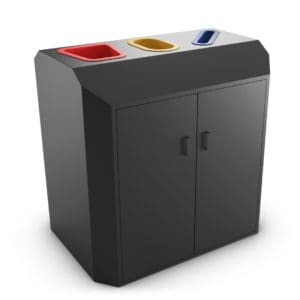 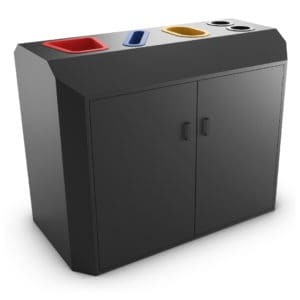 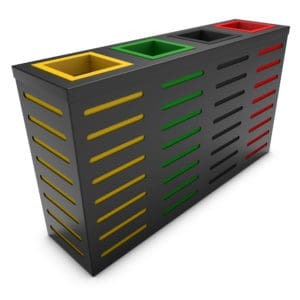 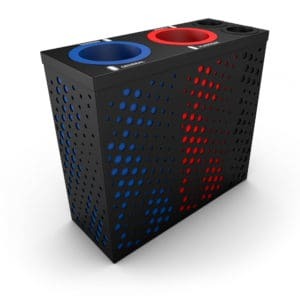 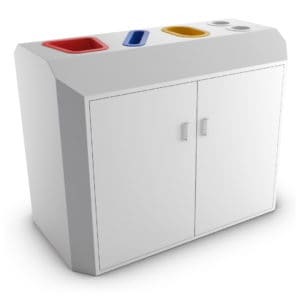 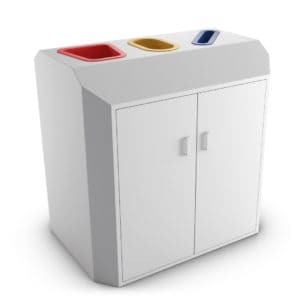 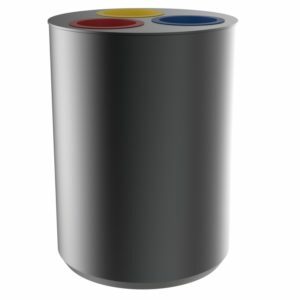 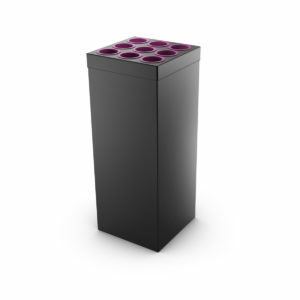 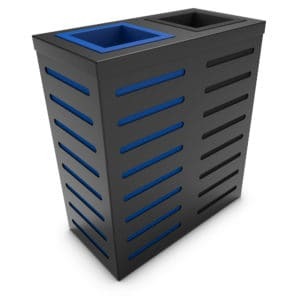 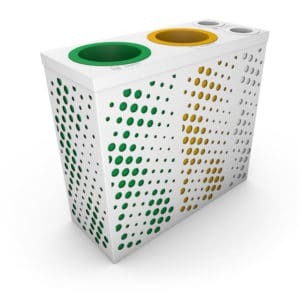 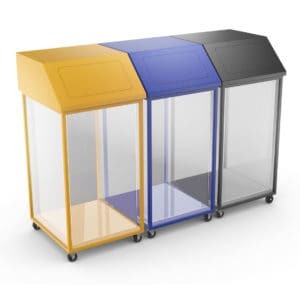 Our 3-compartment Andromeda recycling bin is an excellent example of what we offer regarding colorful indoor recycling containers. 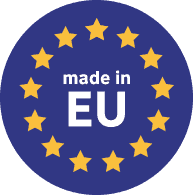 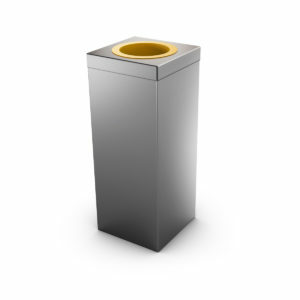 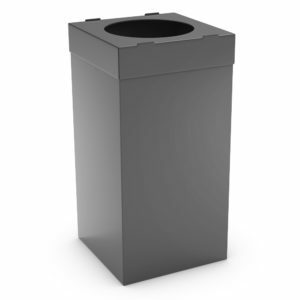 From 35L, 60L or 100L, it is ideal for separate waste collection and is ideally suited for use by companies, local authorities, public administrations, and state corporations. 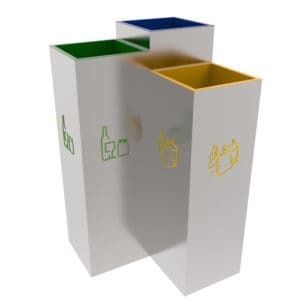 Discover for example our Auriga model, a recycling bin for interiors with 3 bins and banners. 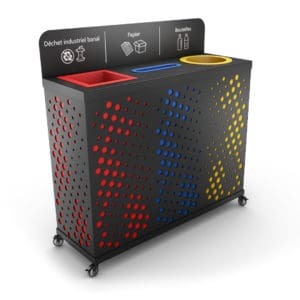 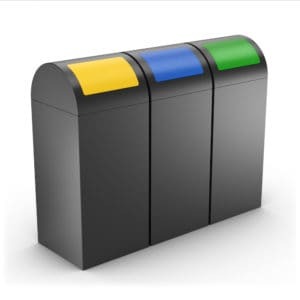 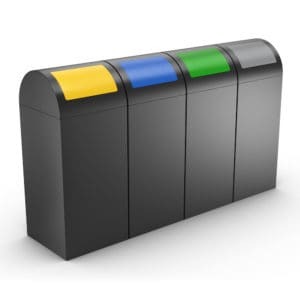 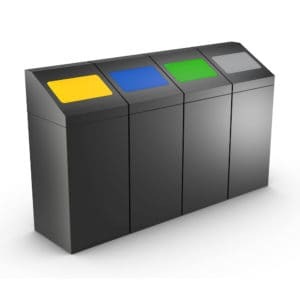 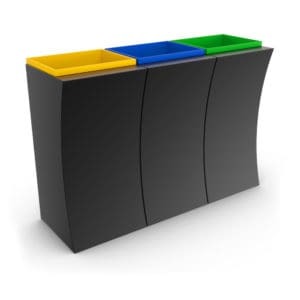 This waste distribution solution combines colors, logos, and signs for a flawless distribution and recycling optimization. 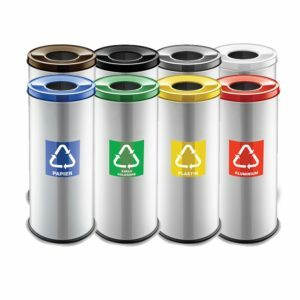 According to the Ademe, an employee in the tertiary sector generates 120 to 140 kg of waste per year, three-quarters of which is paper. 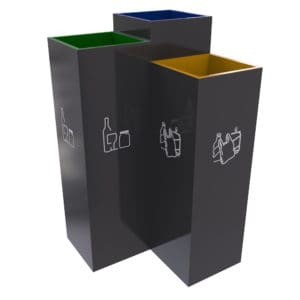 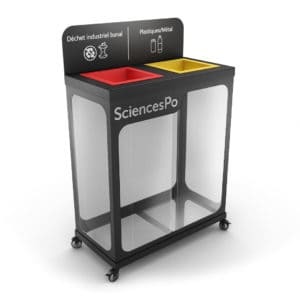 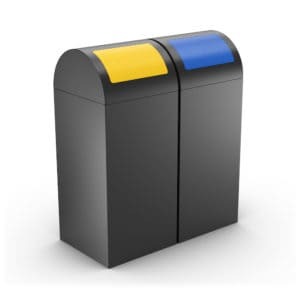 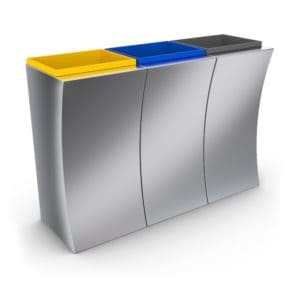 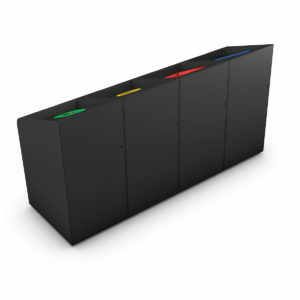 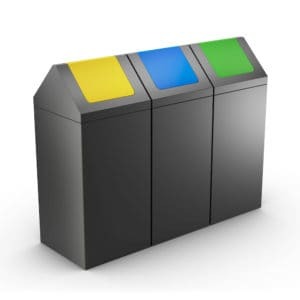 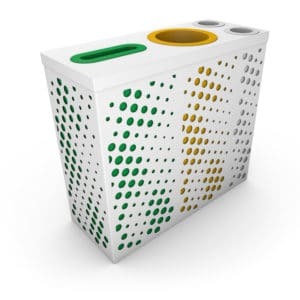 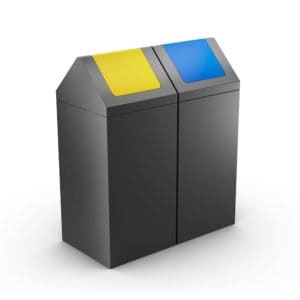 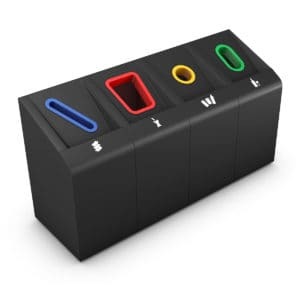 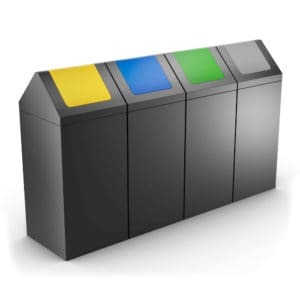 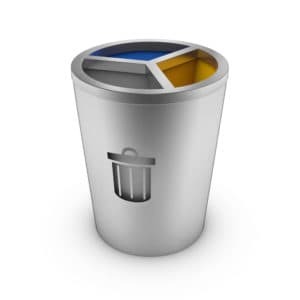 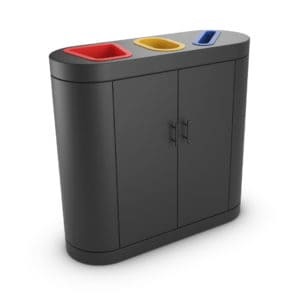 Because office waste has its specificities, we offer you many recycling bins specially designed for this purpose. 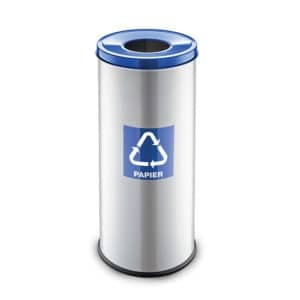 Some may have bins for paper & plastic, others may have a cup bin, and others may have a compartment for general business waste. 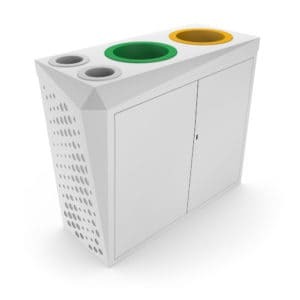 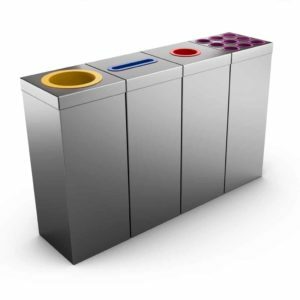 The bins can be modulated according to the model to adapt to the environment for which they are intended. 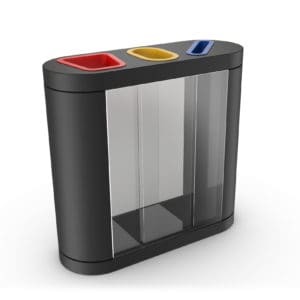 The cup tray can be installed near the coffee machine, for example. 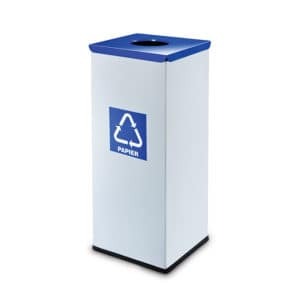 As for the paper and organic waste bins, they will be located in the meeting room and the break room respectively. 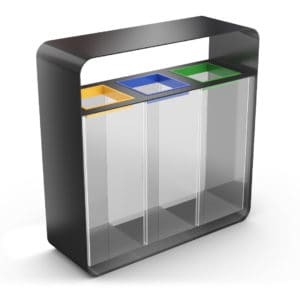 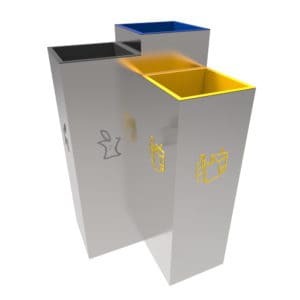 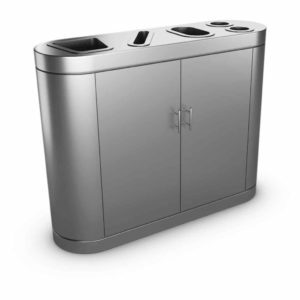 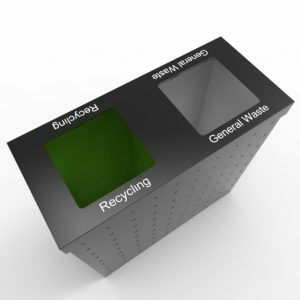 This is the case with our Vaxjo model, a metal bin for recycling, with an independent office wastepaper basket. 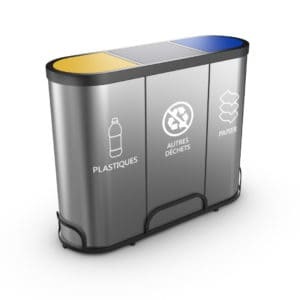 To meet the specific recycling needs of this sector, Urbaniere has models specially designed for canteens and company restaurants, such as Tri-Resto. 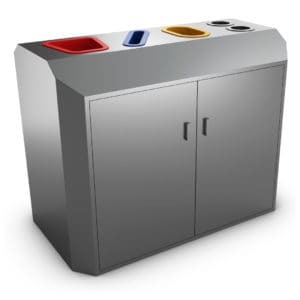 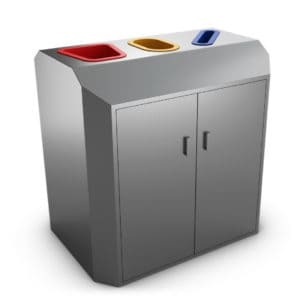 This particular recycling bin for restaurants, cafeterias or canteens is made of wood & stainless steel as well as 2 compartments of 90/100L. 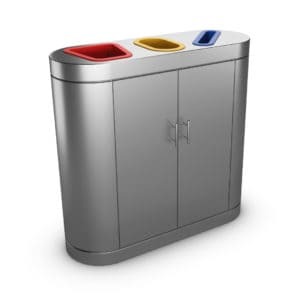 Finally, it has a tray deposit system to simplify waste management and offer “self-service” functionality. 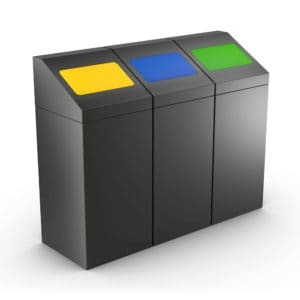 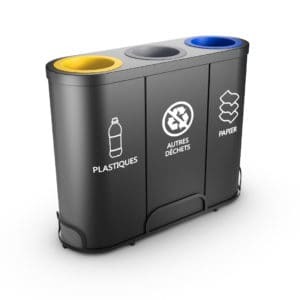 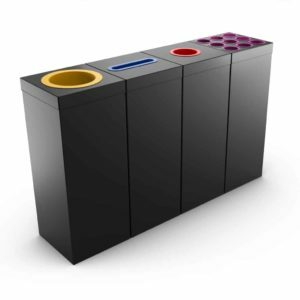 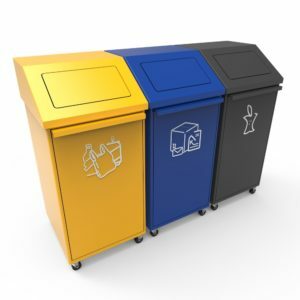 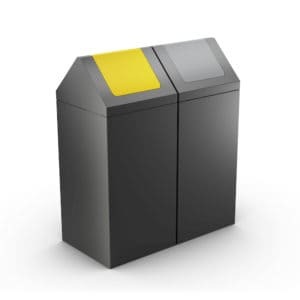 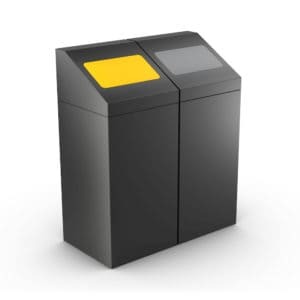 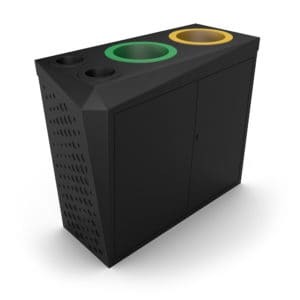 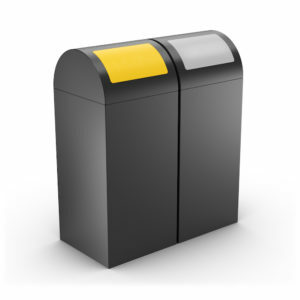 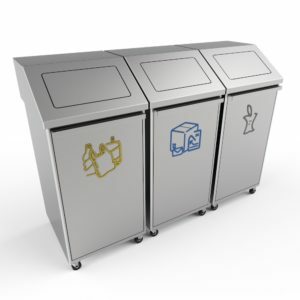 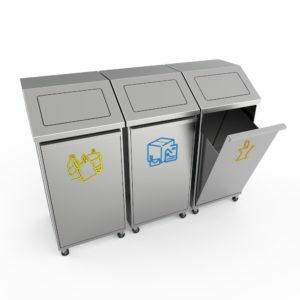 To offer its customers cutting-edge and innovative waste management solutions, Urbaniere provides a selection of smart and connected waste bins. 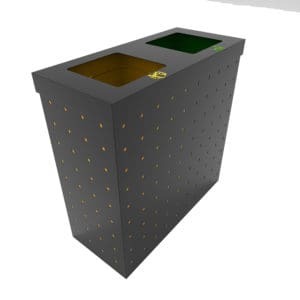 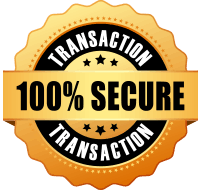 To optimize collection and allow companies to save money, discover our containers equipped with sensors to warn of the filling rate and geo-locate the various containers. 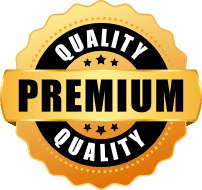 Your maintenance teams will be able to review their itinerary, their work schedule and travel only when necessary. 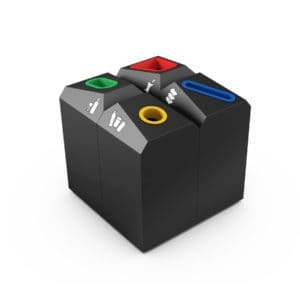 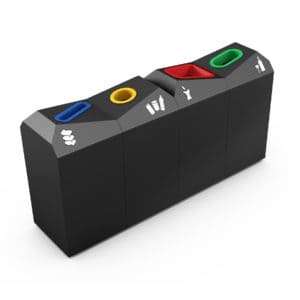 The Auriga connected version is a perfect example. 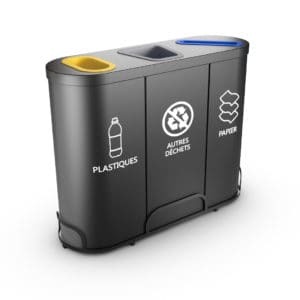 With its integrated smart level sensor, it provides information on the level of waste in each compartment, automatically alerts the cleaning service, and offers automatic reports on waste and recyclables to minimize waste disposal costs. 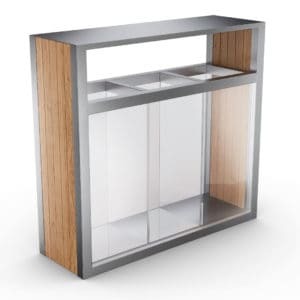 In steel, stainless steel, wood, to name a few. 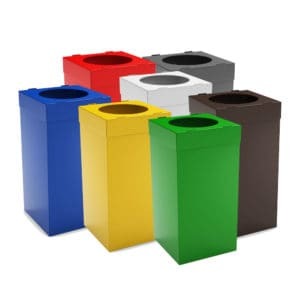 Stylish, colorful, discreet, modern, original, and so on. 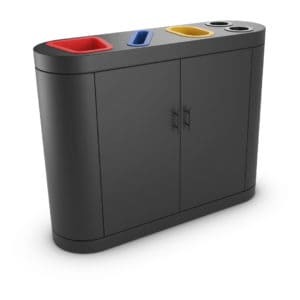 Small or large capacity, and so forth. 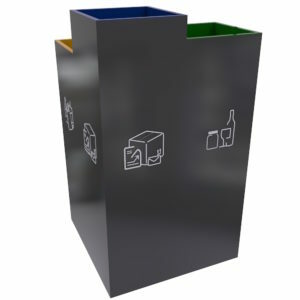 Urbaniere customizes on request your indoor bins according to your needs but also your decoration and your budget. 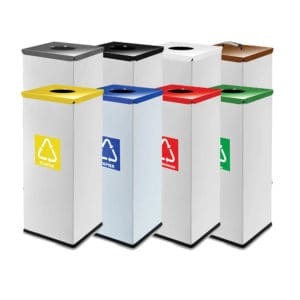 Feel free to contact us for advice or to find out more about our recycling containers for indoor use.